I’ve been noticing Frontier pushing its $20 deals lately. I find these steals are usually for routes in the Midwest and south, but there are a few deals for the west coast. You can try searching directly from Frontier’s website using the month-view feature. Unfortunately, it will only display the price for “Discount Den” members. Instead, try searching the same route on Google Flights. It will display the non-discount price and also compare it to other airlines. The real secret is to not buy your flight online. Frontier, like Spirit and Allegiant, charges a fee to use the website. It can vary from $9.99 to $19.99. 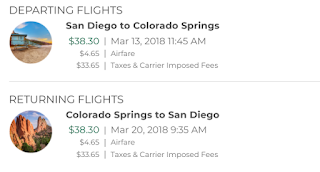 Lately, I’ve noticed the higher fee for lower fares. 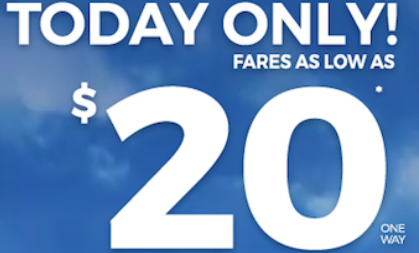 For our upcoming trip, I got an e-mail from Frontier advertising $20 base fares to destinations from Austin. Out of curiosity I looked up San Diego to Colorado Springs, which wasn’t advertised in the sale, but was priced at $20 for select dates through March. Google Flights listed the all-in one-way price at $39. Frontier is the second least convenient airline to buy tickets at the counter (Allegiant takes top honors). The counter near us is only open three times a day and despite signage indicating otherwise, you’re only guaranteed a shot to buy tickets 45 minutes prior to the airline’s departure. Any later and you risk the agent closing the counter, any earlier and you risk getting stuck behind passengers trying to check-in for their flight. In my case, I found a flight departing for Orlando around 10pm. I got to the counter around 9:15pm and waited for two customers to check-in before I could buy my ticket. The agent sped through the process and two minutes and $38.60 later I had my ticket in hand. From that, Frontier will net a whopping $4.65 each way. Website total with "Carrier Interface Charge"
Sometimes you’ll get an agent who isn’t familiar with sales. I was told they don’t do too many ticket sales at the airport compared to Spirit. It helps if you go prepared with your departure date and flight information. Also, estimate how much it will be. On rare occasions the airport price may not match what you found online. Airport total without "Carrier Interface Charge"
Frontier also earns bonus points over Spirit in its communication. Since we’ve purchased tickets before, I automatically get an email confirmation. I’ve also found Frontier will assign seats together when buying at the airport. Spirit does neither. I always have issues entering my Known Traveler Number. Frontier’s site mandates the customer’s address fields be filled in before you can enter the KTN. Unfortunately since you’re buying at the airport, the agent isn’t required to enter in that information. Twice I’ve had to call in to have an agent override the system and enter the data manually. Overall, it’s a small hiccup for some meaningful savings.